Where do we find Christmas Island? Christmas Island is an Australian island in the Indian Ocean and is located 360 km south of the Indonesian island Java. The Australian Christmas Island has a length of 19km and a width of 14,5km. The total acreage concludes 135 km2 and it's populated by more or less 1843 people. Murray Hill is with its 361m the highest point of the island. The island is actually the tip of a mountain that from a depth of 4200m from the ocean floor reaches a height of approximately 300m above sea level. 63% of Christmas Island is said to be national park. Some small animal species have become extinct on Christmas Island already. The fruit bat, which plays an important role in pollinating and the dissemination of seeds, is currently threatened with extinction. The island is mainly inhabited by 13 species of land crabs and various types of seabirds. Christmas Island is primarily known for the annual migration of the red crabs. In November or December, at the start of the wet season, an estimated 120 million red land crabs come from their underground holes, to flock to the beaches and the Indian Ocean. This migration takes about 5 to 7 days, and only after sufficient rain fall and not too much sunlight. If it's too dry and hot outside, the red land crabs shelter in their underground holes, to not risk getting cooked alive in their shells! During this trekking, the roads on Christmas Island are regularly closed off so that the animals can continue their way quietly without getting run over. When the red crabs arrive at the beaches, the males firstly grave a love nest where after the mating can begin. Once the males have fulfilled their duty, they go back to their original habitat in the rainforest. The females stay a little longer at the shore, so that they can lay their eggs in the water at the time that the difference between tides is the smallest. All, at their risk of life and chance of drowning, while dancing under the full moon, the females make way to the water to unload their eggs. After about a month, millions of small red crabs crawl out of the sea to live on the mainland. This intriguing spectacle is captured in many documentaries and attracts many tourists every year to Christmas Island. Another well-known crab species on Christmas Island is the coconut crab or robber crab. It's a true omnivore that without batting an eyelid steals its food and even consumes other dead crabs. Coconut crabs can be quite large and usually have impressive claws. Some common bird species on Christmas Island are the Red-footed booby, the Brown booby, different types of Frigate birds, the common Brown noddy, the Emerald pigeon, the Christmas Imperial pigeon, the Golden bosun and 86 other migratory bird species. The island is also the only breeding ground for the endangered Abbott's booby. The vegetation mainly consists of 25 different tree species that form a dense rainforest. On the branches of the trees grow ferns, orchids and vines. From the approximately 135 different plant species on the island, 18 of them aren't found anywhere else in the world. Christmas Island has some of the best dive sites in Australia, where kilometers long and deep drop-offs sometimes are just 20m from the coastline. Christmas Island is situated right on the edge of the Java manger, which is the deepest point of the Indian Ocean. On Christmas Island, you can both dive on large and small marine life. The following species, among others, can be spotted: whale sharks (from November to April), dolphins, mantas, turtles, rays, groupers, snappers, sea bass, red bass, rainbow runners, giant trevallies, tuna, barracudas, swordfish, silky sharks and reef sharks. From the depth, you can come across hammerhead sharks, tiger sharks and gray reef sharks. In the vicinity of the corals you'll find especially the following colourful reef fish: butterfly fish, bat fish, flying fish, moray eels, surgeon fish, gobiidea, lizard fish, clingfish, soldier fish, squirrel fish, coral climber, cardinal fish, fusilier fish, goat fish, angel fish, small red damselfly, wrasse, parrotfish, hag fish, wormfish, moorish idol, mask whipped fish, doctor fish, flatfish, triggerfish, leather jacket fish, filefish, honeycomb cowfish, boxfish, puffer fish, hedgehog fish, seahorses, slugs and other small water animals. Due to their many years of experience Extra Divers on Christmas Island knows that there's a chance on passing whale sharks all year round. There's a greater chance of spotting them in the rainy season, when the red crabs lay their eggs in the Indian Ocean. Apparently, they find it a delicious snack! At higher water temperatures, the whale sharks go a little deeper than in colder water. Also Hammerhead sharks can be found here all year round. Sailing fish, manta rays and the fellow fin tuna you can find during the wet and dry seasons. The slogan of Extra Divers on Christmas Island therefor is 'Expect the unexpected'. Do not dive with too many expectations, enjoy the beautiful underwater landscapes and allow yourself to be pleasantly surprised when big fish pass by. Extra Divers can almost always guarantee to show you giant trevallies and silky sharks on a snorkeling site on the north side of the island. Only during the wet season, they have no access to this dive site because of the strong currents. In total, there are 37 different places on Christmas Island on which you can dive. 25°C is the lowest temperature of the water of the Indian Ocean that lasts from July to mid-September. Mid-wet season, the water is the warmest with a temperature reaching up to 28°C. During the plankton breeding period the visibility is only 10m; outside this period the visibility can be up to 50m. Rain affects the visibility of the ocean water to a lesser degree. In addition, snorkeling can be done in the narrow strips of shallow water. Here you'll be surprised by the colourful marine life that is present between the beautiful corals. The most popular place for snorkeling is the Flying Fish Cove. When the ocean is too rough, you can go to Ethel Beach instead, where you can snorkel in a sheltered area. Extra Divers opened its dive center on Christmas Island in September 2016. Extra Diverse features two aluminum yachts (10m x 4m), with two outboard motors of each 250HP. The cruising speed is 12 knots. The boats are very well constructed and very suitable for diving. Both boats can accommodate 18 divers, two dive leaders and a captain. To make it more comfortable though, Extra Divers only takes 16 divers per boat. Each boat comes with oxygen, the necessary life jackets, a life raft and a toilet. There's also always sufficient drinking water, biscuits and nuts for the divers. We jump in the water through a little side door, which actually, is quite handy. To get back on board, we use the two solid chicken ladders with rather wide steps that hang on the back of the boat. The boat is also covered, so we're protected from both bright sunshine as well as rain showers. In the covered area are bars, on which the divers can hold on to when they want to move from one place to another. This prevents you from falling. Each diver has a private seat with space for two aluminum dive tanks of 12liters (standard one crane Din, but Extra Divers also brings adapters). Under the seats, all diving equipment and cameras are stored. Extra Divers goes for two morning dives and two afternoon dives daily, with each time another boat and another group. They alternate groups to allow everyone the opportunity to dive at different times. This system allows Extra Divers time to prepare the boats for the next dive, as well as getting their tanks ready. With the exception on cameras and dive computers, all diving equipment on board needs to be taken off board after every dive. 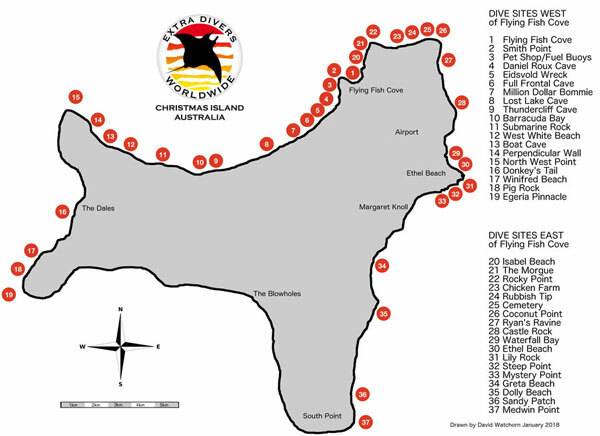 The furthest dive site Extra Divers has on their program is at a distance of 1h15min from the port of Christmas Island. The nearest dive site is within a reach of two minutes. The choice of the dive site depends on the gravity of the current of the Indian Ocean. From December to March, the east side of Christmas Island is usually quite quiet. The other months, depending on the weather conditions, the divers especially head to the north side. Sometimes they set sail to the west side, but given the further distance, an additional fee will be charged for the fuel. Because of the unpredictability of the Indian Ocean and difficult accessibility Extra Divers has very little experience with diving on the south side of Christmas Island. Unfortunately, there's no decompression chamber on Christmas Island. There's a small hospital, but so small, possible operations can't get carried out; not even fractures. In the event of a serious (diving) accident, all evacuations are transferred to Perth in Australia per private flight. The hospital takes the organization of this process on them, but the waiting times can vary from 8 to 14 hours as the planes should fly from the mainland. Estimated costs for foreigners who must be evacuated are around 80,000 AUD for the flight only. For natives, the flight is free and paid by the Australian government. In the past, tourists who wanted to visit Christmas Island in Australia first had to go to Perth in Australia to fly back for five hours to Christmas Island. A bit of a venture, that for many would be way too intensive. Since August 2016, there's a Garuda-charter that once a week (on a Saturday) flies from Jakarta in Java to Christmas Island. This flight only takes one hour; which with such a time safer, should attract many other tourists to the island. Strangely enough, this Garuda flight can't be found anywhere online. Apparently, it's a kind of private initiative that's sponsored by Extra Divers and can only be booked through a specialized travel agency such as the Dutch Diving World. There are also Virgin Australia flights on Tuesdays and Fridays from the Australian mainland, but these are frequently canceled. Recently, from Kuala Lumpur in Malaysia a charter flight started operating, flying every two weeks on a Tuesday to Christmas Island. However, it's not yet known if this flight will be maintained or how reliable this connection is. After a week of diving in the spectacularly beautiful Flores - Indonesia, we fly after an overnight stopover in Jakarta to the Australian Christmas Island. Here too, we hope to come across beautiful underwater life and with a little luck we can even admire the annual red crab migration. After a short flight of just an hour, we set foot on land on the green island where we, together with a number of other divers from mainly Germany and Singapore are met by two representatives of Extra Divers. After everyone has confirmed his and her presence, we drive to the Flying Fish Cove, the tourist centre where all the hotels and accommodations are located. On the way, dive guide Dave gives us the some useful information about the island. After a 15-minute drive, we are dropped off at The Sunset Hotel and we take the Superior Ocean View Room. The view from our room over the Indian Ocean is sublime. The hotel looks a bit old fashioned, but the room is spacious and equipped with all the necessary comfort such as air conditioning, a fridge, a microwave, a kettle, a toaster, a hairdryer, a large flat-screen TV and last but not least, an iron and ironing board! We get 30 mins to settle and find our diving gear and then we're expected at the nearby Extra Divers Club for an extensive briefing. First, the usual administrative formalities in chronological order and where after the necessary information about the next diving days. In which as well, a lot of attention is paid to the safety aspect. Apparently, it's high season, because most days the boat is almost full, at its maximum capacity of 16 divers. We are classified in two groups that alternate, starting in the morning (at 7.30pm) and in the afternoon (at 13.30pm). However, as we prefer to dive in the morning every day, the person in charge at Extra Diverse is flexible enough to meet our demand. Since none of the hotels on Christmas Island offers breakfast, lunch or dinner, and the nearest grocery shop is closed on Saturday and Sunday, the people of Extra Divers propose to take us to another supermarket to get some food for the coming days. When we arrive, we can just catch the last (deep frozen) bread. Next to that, we pay up to 12.50 AUD for a big pot of Nutella. Since it's an island and all products are imported, most of the food here is ridiculously expensive, including the iceberg lettuce and milk. In the meantime, it started to get dark and we make way to the Golden Bosun, the one and only bar of Flying Fish Cove, which is located just next to the hotel and the diving school. Here we enjoy the view of the ocean with a refreshing drink and a delicious meal. The light of the setting sun we get for free. In advance, all the diving equipment of Extra Divers gets taken onboard. We only have to take our own cameras and diving computer and of course install these ourselves. There is also an Analox oxygen meter to measure the oxygen percentage of your Nitrox mixture. First, we get a general briefing about the boat, safety, life jackets, tightening of the dive tanks, drinks, biscuits, toilet, ways to enter the water and ways of recovery of the divers. In some cases, all of these formalities are repeated in a separate briefing, so that all info is fresh in our heads. Everyone dives with aluminum bottles of 12 liters and buddy team diving is required. At 50bar, each buddy team needs to make a safety stop and at 30bar, everyone needs to be back on the surface. In other words, the dives take 60 minutes, after which we subsequently make a safety stop on 5m back to the surface. It's also important to remain close to each other on the surface of the water so that it's easier for the captain to anchor the boat on the right spot to help all divers back on board as soon as possible. Finally, in the context of the general safety it's forbidden to return or to go under by yourself, because the captain at all times must be able to see all divers. To reach dive site Submarine Rock, we sail in 35 minutes from the port of Flying Fish Cove to the north-west of Christmas Island. The water temperature is 28°C and we have a sight of certainly 20m. Submarine Rock has a drop-off of 50m in depth, where the steep rock walls are covered with brown stone corals, with between many reef fish swimming around. It's recommended to regularly look in the blue to see the larger species. During this dive, we spot mainly White tip reef sharks, tunas, Jacks and Giant trevallies. From 9m depth, the steep wall goes over onto a sloping bottom which opens on the surface of Christmas Island. The safety decompression stop we can easily achieve on Submarine Rock. Afterwards we go back in the blue, so that Extra Divers can pick up easily with no risk of beating rocks or coral. During the mandatory resting period between the two dives, the captain slowly starts the return to the port, but a bit further to the east. The dive site The Morgue is situated just in front of the diving school Extra Divers, but due to the steep rocks unfortunately not accessible from the side. The Morgue consists of a gently sloping rock bottom that goes to a depth of 40m. Here as well, we see a lot of brown stone coral, with reef fish; some species we haven't even seen anywhere before. We also spot some special crabs and shrimp, but further than that there is little macro life to discover today. In the deeper part, we regularly see a white tip reef shark, along with some of the big schools of fish. On the surface, we come across a big school of crocodile longtom fish. After we get back at The Sunset, we eat a quick sandwich in the room and jump in our 4x4 rental to explore the island. The sun shines profoundly on our black Toyota, resulting in a hardly functioning a/c. We decide to drive to Hugh's Dale Waterfall on the west coast, as we've heard that here we'll have the best chance to see the indigenous blue crab. After half an hour of driving through dense rainforest, we make a turn to a gravel road that's just suitable for 4x4 vehicles. We pass a pond with fresh water, where we get a first glimpse of these cheeky blue crabs. They are cautious, when we approach them, the creep away in their small holes or dive under a tree trunk. Once we have reached our destination, we park the car and start the 30 minutes walk to Hugh's Dale. The largest part of the journey is equipped with boardwalk, so we don't have to walk too much along the maddening stones. The steeper passages are supplied with stairs. The closer we approach the waterfall, the more crabs we see. Here, we don't only see the Blue crab, but also the Giant robber crab and Coconut crab, the largest on land living Lobster-like, that can get reach the respectable age of 70 years. How impressive, these animals they have here on Christmas Island! When we're done taking the necessary photos, we make our way back. It already is half past 4 when we arrive at the car. We are in a little bit of a rush to get back in the hotel, because we certainly don't want to drive in the dark on a unlit and unknown road. Once we're back at The Sunset, we walk once more in the direction of the Golden Bosun to strengthen our inner man and take a moment to chat about this successful first day on Christmas Island. The name of this dive site is based on the rock in front of the coastline where there's only a palm tree; a sort of reference point. Coconut Point consists of a gently sloping bottom with stone corals of different colours, but brown remains the most dominant. Here as well we see many reef fish and some even swim by in schools. The gentle slope of Coconut Point drops from 11m depth to 50m depth. This drop off is nicely grown with gorgonians and stone coral. In the blue, we spot among others, the wahoos, tunas and giant trevallies. Coconut Point is definitely worth it! Between our two dives, the captain of Extra Divers drives us to the only place where fishermen clean their catch and may throw the rest back in the seawater. If there's a passing boat, the giant trevallies immediately come to see if there's a tasty snack. Anyone who'd like to, is allowed to jump in the water to go snorkeling. There're 16 giant trevallies to admire, but unfortunately no shark or tuna. When the boat goes on a bit further, the trevallies follow submissively and subsequently leave the Orphaned snorkelers without any guilt feeling. In any case, nice little extra detail! In the rock walls of the dive site Full Frontal are some shallow cavities, which are inhabited by countless Striped brushing crayfish. The animals can be photographed with ease. The gently sloping bottom consists of a bit of sand and much-covered rocks. In the crevices of the rocks you can normally find electric shells; which, of course, aren't actually electric, but give off the same kind of light when you shine a torch or light on them. Unfortunately, no one can find one today. Full Frontal softly declines to a bottom of 14m, but then evolves in a steep slope of 45° that extends to 35m in depth. During this dive, we mainly see brown stone corals and many reef fish. In the afternoon, we take our 4X4 terrain car again and make way The Blowholes, a place on the south side of Christmas Island where, according to the information brochures you can encounter the red crabs. Once we've arrived on the spot and slowly walk in the direction of the coast line, we immediately get a huge splash of seawater sprayed over us. We scream it out and try to keep our camera as dry as possible. Fortunately, we have a towel to dabble the lens. What an entrance! It's a hopeless case to stay dry at this viewpoint, as the Ocean water beeches the rocks with an enormous force. We're therefore looking for a place where we're at a safe distance from this natural spectacle. Fortunately, we also took our drone with us to shoot more beautiful pictures from the angle of the sky. We had, however, never taken into account the aggressive Frigate birds, which see the device as an intruder of their habitat. A group of five to six birds tries for more than 10 minutes to approach and attack the drone. Some come too close and are touched by the device, resulting them to be deterred. Shortly afterwards they declare another attack, with as much enthusiasm. After a while they give up the fight and we can without interference complete our videos. According to the lady from the Visitor Information Center of Christmas Island the crabs should be at The Blowholes, but we see none. Because of the long-term drought and heat the animals remain well hidden in their underground holes. If in any other case, they come out when there's the daylight, they'd be cooked alive in their shell. Painful! Then we drive to South Point, the most southerly point of Christmas Island. Besides a stunning view of the Indian Ocean and two Chinese temples there is little to do. On the way back to the hotel, we make a short stop at Margaret Knoll, a beautiful lookout point on the underlying forest and adjacent ocean. Here we should see several types of Frigate birds, Red footed Boobies and Down Boobies, but they also seem to have a day off and stay away from our camera lens. Once we are back at the hotel, and have refreshed ourselves, we have to find another restaurant as the Golden Bosun is closed today. Easier said than done. Despite the fact that there are several dining options in town, we can't straight away find them in the dark. As they don't use any illuminated signs we find it difficult to distinguish an ordinary residence from a commercial business. With luck on our side, we come across Rummah Tingi, according to the locals the best restaurant on Christmas Island. They have a fairly similar menu to the Golden Bosun, all dishes are though, a little more expensive. For two main dishes (excluding drinks), we pay about 90 AUD. We still end the day in glory, as when we walk back, we pass by a red stray crab that started the migration too early. Which, in the end results in some cool pictures! The dive site Perpendicular Wall is in the far north-west of Christmas Island. As this site is right on the corner of the island, where the open Indian Ocean streams towards, it's only possible to dive, when the wind isn't too powerful. During the dives, we look in the blue and see among others a hammerhead shark, a few white tip reef sharks and some giant trevallies. On Perpendicular Wall we jump into the water to a steep rock wall where several red crabs linger. Up to a depth of 11m depth, we have a soft descending soil; followed by a beautiful drop off with plenty of stem coral and gorgonians. Many Reef fish, schools of small fish and a beautiful school of Batfish come here to life. In some hollow cavities, we find some hiding Moray eels, who get pampered by the brushing and polishing fish. How cool we can observe it from this close. The dive site Flying Fish Cove is just west of the port of Christmas Island. We start on a gently sloping bottom; from 18m, there's a small drop off and then it goes back to a slope. Here, too, brown stone coral dominates the view. Except for the usual Reef fish, we see a large Crawfish, a bit of coral, some shrimps in their shells and some crabs hidden in the Comatulida. The crabs are so active that we can't photograph them. A pity, but it's beautiful to look at! This afternoon Dolly State Beach is on the program, an idyllic beach where Coconut crabs and turtles nests. From the moment, we leave the main road, we drive over a narrow path through the dense rainforest. Daily, only but a few cars pass through, making it that some green places have a tendency to grow back. Our 4x4 vehicle sometimes literally paves way through all the foliage. How quiet and beautiful! Along the way, we see a small pond, where we encounter some blue crabs and a coconut crab. Great start! At a certain moment, the road stops and should we continue on foot. Fortunately, a large part of the footpath is already built on elevated metal plates so you're less likely to stumble over stones or tree roots. According to the information sign, the walk is 1km long and takes approx. 1 hour. In reality, we walk certainly 4km through the dense vegetation. We get the feeling we're walking through a real jungle with all those different trees, plants and ferns. Brilliant! After 45 minutes walking through wilderness, we arrive at Dolly Beach. A beautiful deserted beach with fine white sand. The elegant swaying palm trees and drizzling high waves of the Indian Ocean complete this ideal picture. Indeed, we find some beautiful large Coconut crabs; some of them even completely blue in colour. The turtles are unfortunately nowhere to find. Thanks to the drone, we can shoot some mighty videos. We'd love to enjoy this idyllic Bounty Beach a little longer, but the clock is ticking inexorably, as we want to make way towards The Sunset before the darkness of the evening kicks in, at any cost. It's a race against the clock, and so we increase the speed on the way back a little. Fortunately, we've taken all photos needed, which saves us from having to stop somewhere else. Tired, sweaty, but satisfied we get back at the hotel around 17.30pm. The dive site Northwest Point is located at the most north-western tip of Christmas Island, where the strength of the Indian Ocean is the strongest. That means that we are going to drift dive with the possibility of catching large fish such as whale sharks, sharks, manta rays, schools of barracudas, tuna, jacks and giant trevallies. The current is strong, but not impossible. Unfortunately, we do not see whale sharks, but we do see barracudas, bigeye trevallies and a turtle. At North West Point for the first 8m, the bottom has a soft sloping and then continuous into a steep slope and a plateau at 40m. At the end of the plateau you get a peek of the deep Indian Ocean. In the case you drift of the plateau, you obviously immediately need to cancel your dive and inflate your OSB, so that the skipper can pick you up. The brown stone coral here as well, is inhabited by many reef fish. On Northwest Point dives are relatively deep. When diving with nitrox; it's therefore important that the maximum diving depth is respected. Decompression isn't allowed, so none can lose track of their diving computer. Because of the depth and strong currents extra vigilance to make sure the air supply is necessary. The dive site Isabel Beach lies somewhere between the port of the Flying Fish Cove and the base of Extra Divers and has a gently sloping bottom with brown stone coral and reef fish. On this dive site, you'll find different types of Moray eels. Unfortunately, none of our group finds one. The other group, which consists mainly of Japanese divers, does spot a Moray eel and are as lucky to take some pictures of it. Suddenly, we see an octopus diving into a corridor under a rock block. Apparently, the octopus is a little camera shy and tries to trick us. In the rock, there are three passages which in the middle are connected to each other. Every time a diver goes into the direction of the octopus, the animal moves to another passageway. After a 5-minute try, we give up and leave without any successful pictures. Octopus - divers: 1-0. A little further, the dive master gives a sign of a porcelain crab present in the coral. The beautiful creature is seated on a tricky place to shoot, but in the end we succeed to take some pictures of the white porcelain crab with its red dots. In the afternoon, we drive to Greta Beach, which is accessible by car via the same stunning road as Dolly Beach. While yesterday there weren't any red crabs to find, today the road side is richly covered with our cute red friends. Today is a cloudy day and it has probably rained here a little, that's why the crabs come out of their holes to search for food. Yes, this is the reason why we've travelled all the way to the Christmas Island! We pick up the camera and start shooting images as if it's our last day. The little ones are rather shy and start walking as soon as we're approaching them and come too close. Fortunately, there are plenty of models. After we've taken the complementary photos, we continue our way to Greta Beach. The closer we approach our final destination, the fewer red crabs we encounter. The ground here is drier and the sun has broken through the clouds. A pity, but today we've certainly seen over a 1000 red crabs. Very impressive! The walk to Great Beach is a walk of only 200 meters and runs partly on increased grills. At the end, you can enter the beach via a staircase along the cliff. The beach is rather small beach and a lot less beautiful than Dolly Beach. In addition, there's a lot of garbage washed ashore and there are no crabs or turtles. Though, there are some Frigate birds and Brown boobies flying over our heads, and it's always pleasant to see the great ocean waves rolling on the beach. On our way back, there are significantly less red crabs to spot. Timing and luck are therefore crucial to see this species in large numbers. Anyway, we're very happy with this experience and do a little rain dance in the hope there will be some precipitation in the next two days. Not until the evening we notice that during our photo session with the red crabs we're eaten alive by the mosquitoes. Apparently, the rainfall hasn't only activated our red friends, but also the mosquitoes had been woken up and they were very hungry! We're covered in mosquito bites, which only at night start to itch horrendously. A good insect-repellent containing 50% deet-content is certainly not a luxury. The rain dance has clearly worked, because last night it has rained for hours. No ordinary rain shower as we're used to in Belgium, but the real downfall where the water pours down from the heavens! Hopefully, this isn't going to have too much effect on the visibility in the water. We'll wait and see . Dive site Boat Cave is located north-west of Christmas Island. It consists of a two-thirds drop off to 50m depth and subsequently to a sloping bottom. On Boat Cave corals grow obliquely against the steep rock wall in the direction of the light. It's advised to regularly look in the blue because there are many schools of small fish swimming around. Unfortunately, the predators are out on expedition elsewhere. At the end of the drop off it's easy to dive on the sloping bottom. There is also a bay in the island rock wall, in which a little boat fits. Funny! On the way back to the harbor, our dive guide is on the lookout, hoping to spot a whale shark. Fishermen have recently had the pleasure to come across whale sharks, but it's actually a little too early in the season. When booking the trip, we tried to bear in mind the seasons as much as possible, but the position of the full moon luring the red crabs to the ocean made our final decision. Choosing is losing! The captain of the Extra Divers again sets sail to the place where the fishermen clean their catch and may throw their waste back into the water. When we approach the location, we see many fish jumping out of the water, which is usually a sign of hunting. We jump straight into the water, but unfortunately, there is nothing (more) to see and also the birds have swapped location. During the further continuation of our snorkeling excursion, we're again accompanied by 16 giant trevallies and as the icing on the cake, at the end of the tour, another silky shark pops up from the depth. What a nice finishing touch! The dive site Smith's Point is located between the port of the Flying Fish Cove and the basis of Extra Divers. The gently sloping bottom is mainly covered with vegetation and stone coral with in between many reef fish. It's an easy dive site and very suitable for a second dive because the depth is limited. This afternoon we have put Ethel Beach and Lilly Beach on the program, two public beaches which are easily accessible by car and don't require extra walks. Ethel Beach is a pleasant sandy beach demarcates by rock walls. In good habit, we're here all alone enjoying the rustling waves in peace and silence. At this place, you can also spot birds such as Frigate birds, brown boobies and the silver bosun. Apparently, this is their favorite place to build nests because there are a lot of birds gracefully passing our lens. Some animals stay very nice on their branch and pose as fully fledged models. Nice spot! From Ethel Beach, you can walk to a view point via a landscaped wooden path, where the waves with an enormous force and elegance beech into the rocks. Here, too, beautiful pictures of the native birds can be taken. Then we walk along a wooden path through the mangrove forest in the direction of Lilly Beach. This pebble beach is apparently the main beach of Christmas Island because there are public toilets, and even BBQ facilities. The high waves coming from the Indian Ocean are very impressive, but in the end we're not hooked on this beach. Dolly Beach still takes the lead on our list of favorites! Also, on Lily beach, we see two rats trying to pick up a tasty snack from the garbage bin. Yokes! On the way back to The Sunset we take some nice photos of Silver bosuns and Brown boobies, who have built their nests in the trees along the main road. We even witness a noisy neighborly discussion involving a Frigate bird and a Silver bosun. Fascinating spectacle! In the meantime, more clouds have formed, and so dare the red crabs to leave their safe haven trying to find some tasty leaves. We can't get enough of them and keep photographing these red creatures. Last but, not least, we see a huge Coconut crab on the middle of the road; the largest we've seen so far. The animal poses willingly for our lens, but it remains suspicious continuously scanning the surroundings with its feelers. Beautiful ending of the day! On our last day on Christmas Island we're not going to dive, so we can explore this beautiful island, one last time. Last night, some serious rain occurred, so when we open the curtains in the morning, we see only dark clouds. Yes! Normally, we wouldn't be happy with this view on our holiday, but here we obviously are, because it means that we have a greater chance on spotting red crabs. There are still some view points on the west side of Christmas Island that we haven't seen, so that's where we go today. Once we've driven in the right direction for a while, we are redirected as the road is blocked because of the red crab migration. Hurray! This is the phenomenon for which we travelled all the way here! We put the car quick somewhere along the side and continue on foot. We walk all alone among thousands of crabs. It's not the real migration with millions of crabs at the same time, making way to the Indian Ocean, but we're very happy to may set eyes on this. Our camera flashes more than ever, and we can't get enough of this magical natural phenomenon. At a given moment it starts to rain harder and we run back to the car. Via a detour, we drive in the direction of Martin Point and Winifred Beach. Once we take a turn from the main road, we are once again faced with the massive presence of the red crabs. They've all crawled out of their hole and walk quietly towards the forest road, driving home therefore doesn't always proceed so smoothly. Occasionally we get out the car and scare away the animals with our big long umbrella back the side berth. Hilarious, because some of the crabs have got their own will and refuse to go into the right direction. To get to Winifred Beach, we should make a 1.5km walk through the rain forest. Since it's still raining heavily and we have no idea about the state of the hiking trail, we take no risk and drive straight on to Martin Point. This is a viewpoint and requires only a few minutes' walk. Here again we have views of the Indian Ocean, but the water doesn't smash beech with its well-known force against the rocks. We don't get that real wow-feeling. We then drive along the same, with crabs studded, forest road back to the main road. In the meantime, it stopped raining and the sun tries to break through the clouds. It has immediate result on the behavior of the red crabs, because they're clearly less plenary. Also, the road way that was blocked this morning, is now back for all traffic. In other words, we've been very lucky to have been at the right place at the right time this morning. Around 15.00pm we're expected at Extra Divers to clear the final bill (80 AUD for 10 Nitrox tanks). Where after, we start the least enjoyable aspect of our trip; packing luggage in order to return home. After a final dinner in the Golden Bosun, all divers and the crew of Extra Divers meet in the bar for a farewell drink. Cozy happening, and at the end of the evening we fraternize with some of the locals, who are always in for a nice chat. Since Extra Divers doesn't pick us up until 12.00pm, the owner of The Sunset lets us make use of the room until noon. Nice gesture that we embrace fully, and enjoy the spectacular view from our terrace. Then our holiday irrevocably ends, and we drive into the direction of the airport, which is super-duper small. Today, just our flight from and to Jakarta is displayed on the signs. The rest of the week, there are two flights from Perth and one from Kuala Lumpur. That's it! The remaining time here, we use optimally by walking back to the main road where there are another 30 or so red crabs wandering in the loose foliage. A nice ending of this special trip! At 15.00pm we depart from Christmas Island and no more than one hour later we set foot on land in Jakartain Java. Unfortunately, we have no good connection with our flight to Doha Qatar, as it doesn't leave until after midnight. Nothing left to do, but endlessly waiting as we can't either check in our luggage until 21.00pm. What a hassle it is, in these airports! During the eight-hour flight to Doha, we try to sleep as quickly as possible, which surprisingly happens fairly easy. After a short transit period in Doha we have another six-hour flight to Amsterdam, where after a 1.5-hour drive to Antwerp, where we arrive on Sunday 11 November around 16.00pm. What a hell of a journey, but more than worth it! Always contact your doctor to check your vaccinations: e.g. Hepatitis A - B, diphtheria, tetanus, polio and typhoid. It's essential to always use sunscreen with a high sun protection factor as the UV index on the island is a lot higher than in many other parts of the world. Even on cloudy days, it's important to protect your skin against sunburn. Use an extra high protection factor when going on the water, as the sun is reflected and the risk on sunburn higher. A good pair of sunglasses for the protection of the eyes and a hat may not be missed. A good trip pharmacy in original packaging is always recommended for travelling. The closest Hyperbaric Chamber Decompression chamber is in Perth in Australia or Singapore. They do not fly to Indonesia for medical assistance. For operations or very serious cases they fly you with flying doctors to Perth in Australia. If the plane is in Australia, it takes 14 hours before you are in the hospital. The cost for the aircraft is an AUD $ 85,000. For Australians, the government pays the costs. Christmas Island identifies a tropical climate and has only small temperature differences. March and April are the warmest months, with an average of 29°C; August is the coldest month with an average of 26°C. During the coldest period the minimum temperature still is around 20°C at night. Occasionally, there's a little rainfall in the dry season which runs from July to the end of October. The wet season starts in November and ends in May. February is generally the wettest month and Christmas Island then deals with heavy monsoon rains. Tropical cyclones can occur in the wet season. This, in turn causes very strong winds, heavy rain and a wild sea. 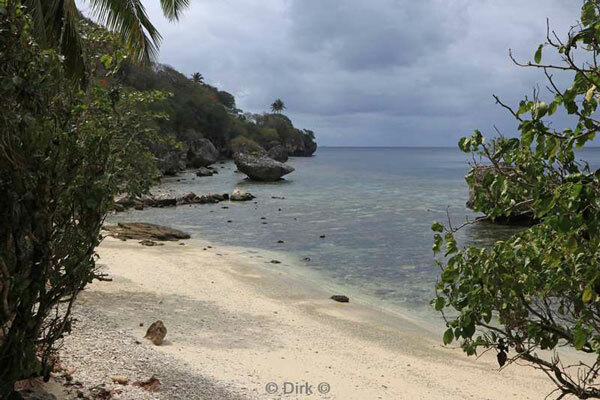 During the Belgian summer time, it is 5 hours later in Christmas Island of Australia and 6 hours later in winter time. English is the official language on Christmas Island of Australia. The electricity net of Christmas Island of Australia is 240v 50Hz. The sockets have a Standard Australian 3-pin plug. The 3-pin plug consists of two flat, 1.6 mm thick pins that form an inverted V and a third lower pin that is slightly longer, is for earthing. Provide adapters, you can not be surprised. 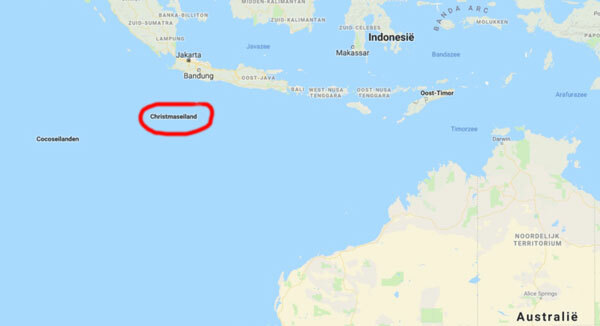 There is no ATM on Christmas Island of Australia. Cash can only be exchanged or picked up at Westpac Bank, which is limited open. Airy clothing. As a reserve a sweater that can sometimes be used in the winter, because it can cool down at night. In Australia's Christmas Island a few other traffic rules apply than to us, eg they drive to the left of the road.